Spawning 9 films and a television series, Freddy Krueger has become one of the most recognizable horror icons of all time. Brought to life by writer/director Wes Craven and actors Robert Englund and James Earl Haley, Freddy first appeared in the film, A Nightmare On Elm Street. This led to the sequels, A Nightmare on Elm Street 2: Freddy’s Revenge, A Nightmare on Elm Street 3: Dream Warriors, A Nightmare on Elm Street 4: The Dream Master, A Nightmare on Elm Street 5: The Dream Child, Freddy’s Dead: The Final Nightmare, Wes Craven’s New Nightmare and Freddy vs. Jason. A remake of the original film, starring James Earl Haley, was released in 2010. Freddy also hosted his own television series, Freddy’s Nightmares. In the movies, Freddy is a child murderer who was tracked and burned alive by the parents of Elm Street. Years later, Freddy began appearing in the dreams of the children of Elm Street, with the ability to actually kill them in their dreams. Though defeated in every movie, Freddy always finds a way to come back. This terrifying figure is brought to supernatural life by the team at Sideshow Collectibles – Mike Najera (Paint), Jeff Yeager (Sculpt), Gidget Earle (Costume Fabrication), Tom Gilliland (Design), Seth Rinaldi (Design) and Joe Allard (Design). 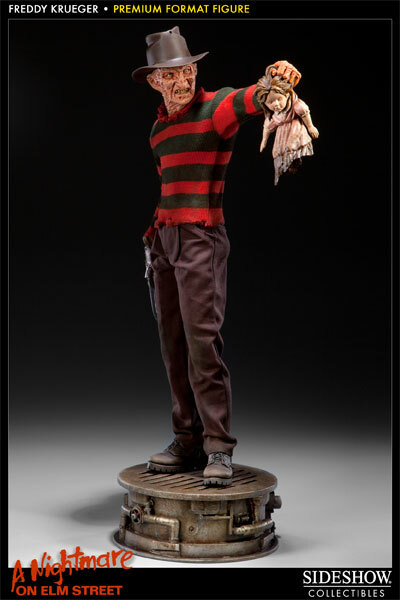 Freddy stands 21″ tall, and comes with his signature fedora, clawed glove and holds a doll’s head. An exclusive version of this figure includes an interchangeable hand holding a skull, and an art print. Tread swiftly through the boiler room to pre-order the Nightmare on Elm Street Freddy Krueger Premium Format Figure from Sideshow Collectibles today!